Peter is a hands-on kind of restaurant owner. When we visited Macelleria he was up a ladder looking at some lighting. He’s moved to Melbourne and this is his first Macelleria outside Sydney. The idea is kind of genius, as the signages illustrates – ‘The butcher who cooks for you’. Roll in, select a cut of meat and have it bought to your table the way you like it. Macelleria (pronounced mar-chill-a-ri-a) occupies 2 storefronts and the set-up is such that there’s ample room. Apart from a few stools at the bi-fold windows all the seats are short metal stools around heavy wooden tables. It’s easy to get in and around. 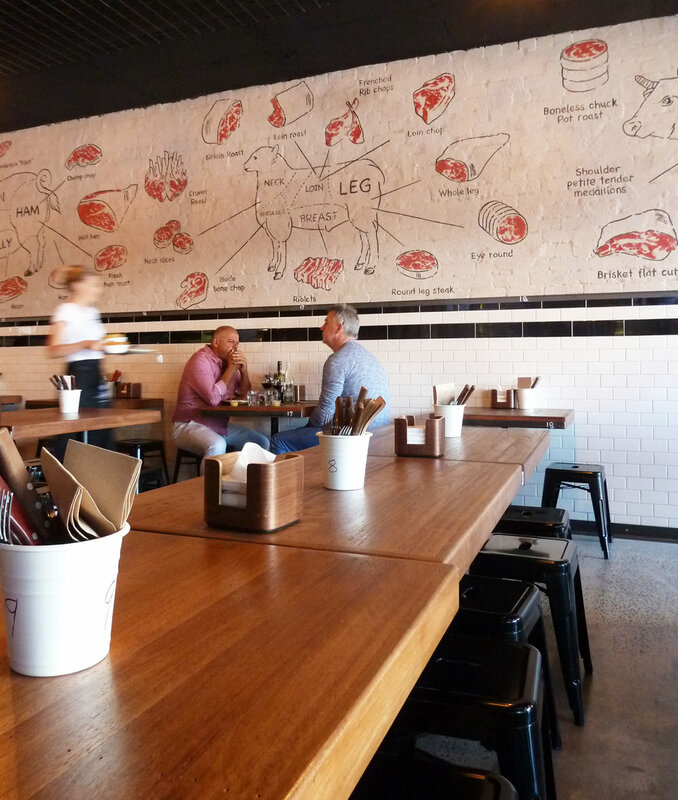 The meat is centre-stage – t-bone, rib eye, sirloin, eye fillet, – it’s all here. And it’s not all beef. Free range chicken, pork and lamb also feature. It’s obvious Peter’s priority is top-notch food in a thoughtful setting. He explained to us the work that went into the Richmond store – meeting and exceeding accessibility regulations. Not just for wheelchair users but for everyone. I expect the same attention goes into the dining experience.